The Malaria Atlas Project – Elimination (MAPe) is an international scientifi c collaboration with close ties to the Malaria Atlas Project (MAP). The primary mission of MAPe is to develop a strategic planning tool for malaria elimination. The strategic planning tool is being developed to support country-level and international planning for malaria control and elimination using a linked set of mathematical models and supporting databases. MAPe thus extends the primary mission of MAP, which is to assemble spatial databases and map the limits of malaria transmission and malaria endemicity within that range. The two projects overlap substantially as MAPe and MAP have developed algorithms that transform endemicity into other quantities that can be used for strategic planning. Databases describing human population distribution being developed by AfriPOP, and new databases describing human movement. Two important endpoints are a map of the basic reproductive number for malaria, R0 and estimates of the malaria importation rates. What intervention coverage levels must be achieved and for how long must those coverage levels be sustained to eliminate malaria? Where is malaria elimination currently technically or operationally infeasible? What are the factors that determine when a country should commit to malaria elimination? What is the rate of malaria importation and how does it a ffect the decision about elimination? What are optimal and practical ways to stage malaria eradication? What are the economic incentives to eliminate malaria and how do those incentives depend on other countries in the region? MAPe have participated in the Malaria Elimination Group (MEG), and they have contributed to Shrinking the Malaria Map: A Prospectus on Malaria Elimination. MAPe played a pivotal role in a collaborative e ffort with the Zanzibar Malaria Control Programme, the Clinton Foundation, and others to assess the feasibility of malaria elimination in Zanzibar. The findings were published in a report, Malaria Elimination in Zanzibar: A Feasibility Assessment. MAPe is working with the Clinton Health Access Initiative and W.H.O. to replicate the Zanzibar feasibility assessment in other countries that are now contemplating elimination. MAPe played a role in developing the research agenda for modeling within malaria eradication, within the e fforts of the Malaria Eradication Research Agenda (MalERA). Following a blueprint described by the MalERA Modeling Section, MAPe is partnering with other modeling teams from the Swiss Tropical Public Health Institute and the Medical Research Council Centre for Outbreak Analysis & Modelling at Imperial College, London. 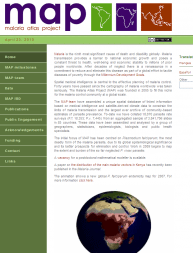 Publications from "Malaria Atlas Project-- Elimination"